As summer rolls on in, British indie-rock band SWIM DEEP delve into their past and give us the album version to "King City". If you've been following this quartet for awhile, then you know that "King City" served as the debut single on their 7" from 2012. And what a year it has been. Having found success on Chess Club Records, SWIM DEEP rejuvenates the track and gives us a cleaner-sounding version. With "King City" benefiting from this retouching, you're set to frolic in the water as it emanates from your speakers. 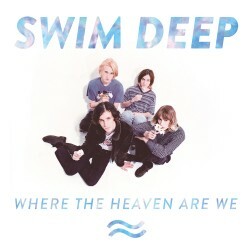 SWIM DEEP is set to release their debut album, Where The Heaven Are We, on July 29 via Chess Club/RCA Victor and then will embark on a Fall UK tour (with tickets going on sale today). SWIM DEEP – "The Sea"